Wally (in snooty accent): Wassap, homey-homes? I'm your main dude brother-man, and such. Ron: Can I wear these? Wally: A commoner... wearing my racing togs?! Ron: Eugh, no! Not your togs, just your clothes. Kim: You rock in stereo, Wade. Wally: (gasps) Is your crib in a hood!? Ah! That could be quite exhilarating! Reporter: Are you saying you would be a better class president than Kim Possible? Kim: Thanks for letting me use your lab, Dad. Dad: Hey, what's federal funding for? Customs: Is this a country? I never heard of it. Wally: By royal decree, I demand a do-over! Wally: Kim Possible, you saved my life. Kim: No big. Just doing the "teen hero" thing. Wally: No. You are a true leader. You have my vote. Barkin: All right, that's two votes for Kim Possible. Zero votes for Brick Flagg. 998 votes for Prince Wally! Brick (to Wally): You had my vote, dude. Way to go! Ron: It's good to be royalty. You get go-karts! Prince Wally: *Where* is that caddy? Rufus: (grumbles) degraded to this (grumbles). Ron: I think maybe we're pushing the royalty thing too far. Wally (shocked): AH! Bite your tongue! Ron: All I'm saying is that's how you grabbed the voters' attention. Now, it seems that they actually *like* you. Wally: Like me? As a- person? Barkin: This is democracy, people! Now do as I say! Wally: Nothing! On second thought, I will grant you nothing! King Wallace: Excuse me, Don, but I really need to talk to Miss Possible... alone. Wade: (of King Wallace) He rules a tiny European nation. Wade: The Middleton mall is more crowded. Wally: (rises from table) Farewell, all! I'm off to biology class! Students: (in unison) Later, Wally! Ta-ta! Kim: Ron, I wanted to run for class president, not class clown. Ron: Suit yourself, clowns have more fun. Kim: Wally won't be here long, just till he's out of danger. Mom: I'll show him danger if he doesn't get a clue! Wally: (In sing-song voice) Oh, Mrs. Possible? Mrs Dr Possible: (In same tone of voice) Ye-es? MHS Sign: PICK BRICK! Paid for by Bonnie Rockwaller. 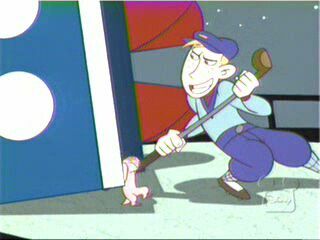 When Ron and Rufus are pulling up the Titanic, how can a little golf club and a naked mole-rat's hands pick up a big ship? ^-- The ship-half was a -- very likely hollow -- mini-golf prop, Ron was using his club as a lever, and the two never actually "picked up" the half, but merely tipped it over onto a nearby slope. Note also that the -- admittedly muscular -- knight was able to lift the ship into the air, and toss it a short distance, unassisted. The lasers fired at Ron, while riding the go-cart in Europe, came from a satellite in geosynchronous orbit. Geosynchronous orbit is only over the equator. No part of Europe is on the equator. ^-- I'll admit to knowing nothing about this subject when your goof was submitted, but from what I've read since, it seems you *may* be confusing "geosynchronous" with "geostationary". More a "Nitpick" than a "Goof": Does Wade *sleep* in that chair? He was in it pretty quickly to have been in bed. I still can't call it a "Goof", but Barkin's hair is blonde again. Is Steve an indecisive hair-color junkie, is the blonde crew strictly an in-school 'do, or are we to assume that this episode falls somewhere in the series' continuity before "Downhill" and "Sink or Swim" (at the least)? And, if it's the lattermost, where's Wally been hiding himself? When Ron gets up from the bleachers to nominate Kim, the blond girl behind him has either no shoes or tight, skin-colored shoes. As Kim tells Wally and Ron what the tapestry said, Ron's sandwich is made of white bread. When Brick sits down, both his and Ron's sandwiches are made of brown bread. By the end of the scene, Brick's sandwich is on white bread, and Ron's is on brown. When this aired on April 19, 2003, Disney accidentally put the credits for Lizzie McGuire. Maybe Wade wears pajamas at night. He probably gets uncomfortable sitting in jeans and a t-shirt. Sort of an immoral lesson, don't you think? Wally is rude, pompous and obnoxious and yet goes on to win almost all the votes. What does that teach us? Ron turns on Kim once Prince Wally enters the campaign - not behavior that you'd expect from your best friend. Have politics and the promise of power corrupted Ron? Most likely Ron joined Wally's campaign at the promise of popularity. Sure Kim is popular, but Wally was super-popular, almost of celebrity status. As we all know from the other episodes, Ron is often shunned and/or ignored by the other kids. It's only natural that Ron should think that, if he hung around Wally, his social status might improve. When Kim says "Scan higher, there's got to be something" Wade looks to a monitor that is located ABOVE him. This is the first time we see Mrs. P really mad at somebody. The first time Kim fights foes that never appear any time later in the series. Beginning this episode (the seventh, production code-wise), Kim's hair is given an outside outline, colored to match her hair's details. At least three members from the KP staff appear in this episode: The Knight of Rodeghan named "Reggie" is director Chris Bailey; The other Knight is character designer Steve Silver; and finally, the guy who greets the Knights at the Middleton airport is storyboard artist Nick Filippi. Prince Wallace (of bubble bath liquid): Three drops. Not four, not two. 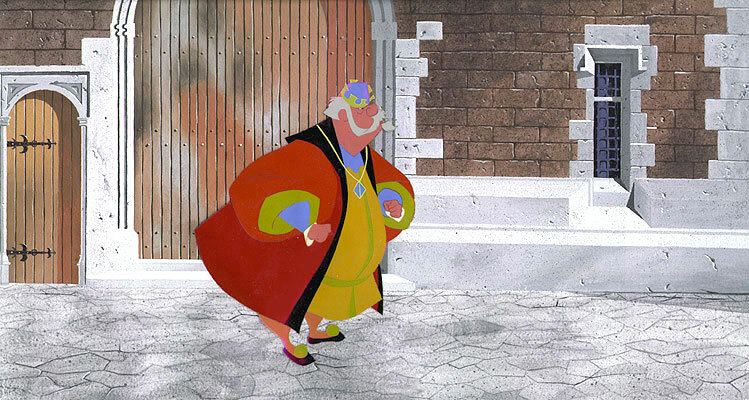 The ancient king looks exactly like King Hubert from the Disney movie Sleeping Beauty. 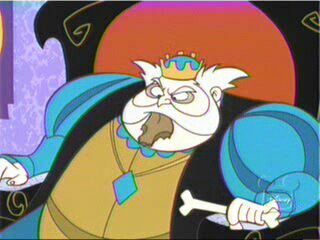 The outfit, the beard, the necklace...right down to the eating chicken on a bone thing. Darth Vader: "All too easy"
Towards the end, one of the Knights says "All too easy" as he is trying to defeat Kim. Darth Vader said this same line as he was trying to defeat Luke in Empire Strikes Back. He and Vader were fighting on Cloud City. Luke fell into the carbon freezing chamber as Vader used the force to activate the lever. (All too easy!) Luke escaped, as did Kim. While doing a report together, my sister found that Prince Wallace was actually the last King/Prince of Scotland. I believe you are refering to William Wallace, the man who fought for Scotland's freedom against the British. A movie was made about this, entitled "Braveheart"